Dear Readers, as usual the blog reports don’t come in a steady flow. This one has actually been collecting dust for quite some time before I decided to go ahead and public it here. It’s a journey back into the early life of Stena Europe, how she was planned, delivered and later, converted for various different services. Hope you will enjoy it! 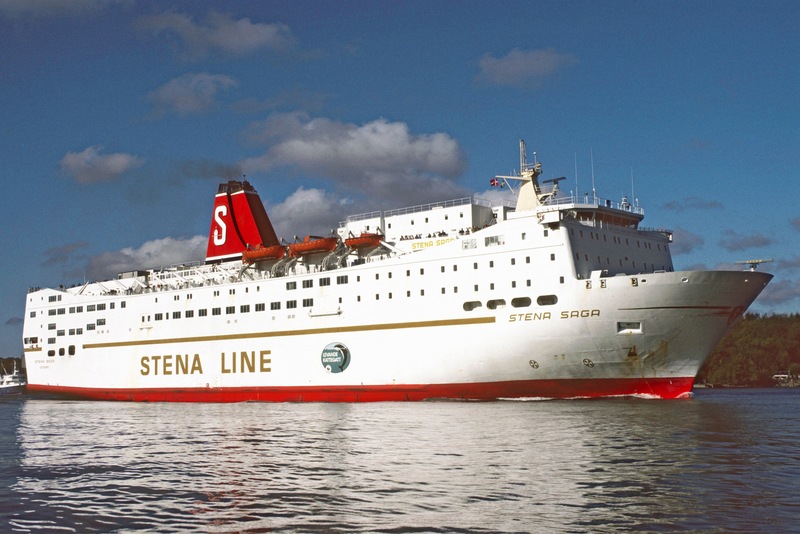 Stena Europe is one of the longest serving vessels in the actual Stena Line fleet. The story began already back in 1979 and it’s no overstatement to call this vessel a pioneer within the modern day ferry industry. Thus, dear ferry enthusiasts, regular travelers, as well as those of you who are just curious, please embark the vessel and join me on this nostalgic voyage back in history… The late 1970’s Scandinavian ferry scene proved to ship owners and operators that competition was getting stiffer with every year. Rising fuel prices and increasing crew costs were some of the factors that made it less interesting to operate several small vessels on the same service. The major ferry operators in Scandinavia, all agreed that jumbo ferries was the way to proceed, and consequently, new ferries were ordered for various routes across the Baltic Sea, for the domestic service to the Gotland island, and last but not least, for the Gothenburg-Frederikshavn route, where Stena Line had been active since the year of 1962. At this time, however, they were not the only ferry operator. GFL, also known as the ‘Sessan Line’ was operating two fairly small vessels, with lack of car deck capacity for the peak season. The Sessan Line and their preferred shipbuilder, the Danish ‘Aalborg Vaerft’, planned for a new generation of vessels, with huge passenger accommodation, as well a massive car deck capacity. The intention was to construct ferries with a capacity that would last for at least 12-15 years. 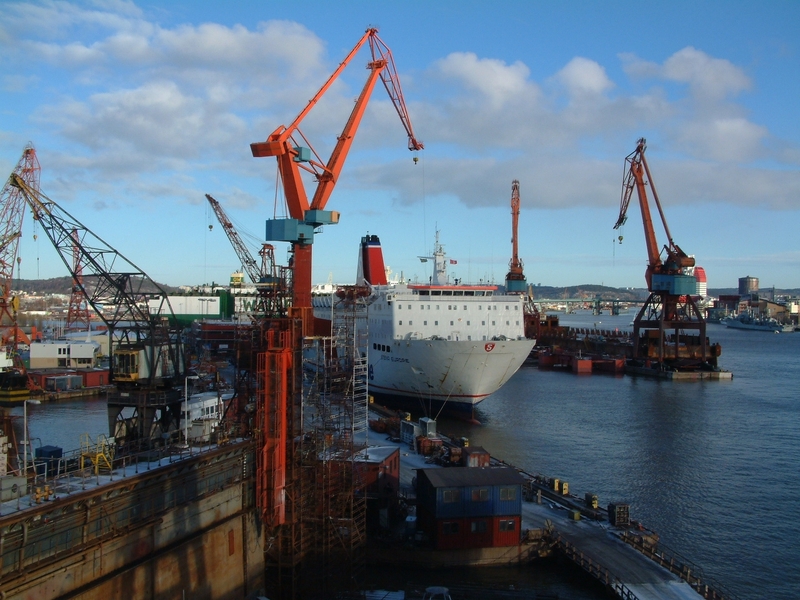 During the tendering process for the new vessels, the Danish shipyard proved to be less competitive than the local GVA – Arendal shipyard, and subsequently, Sessan Line signed a contract with the latter, for two twin vessels, for delivery throughout 1981. Unlike the Aalborg yard, who were specialized in ferries, Arendal had first and foremost built long series of oil tankers and bulk carriers. However, towards the end of the 70’s the Arendal yard, rapidly changed their product range and became a lot more technically advanced, with reefer vessels, drilling offshore units, ferries and icebreakers. 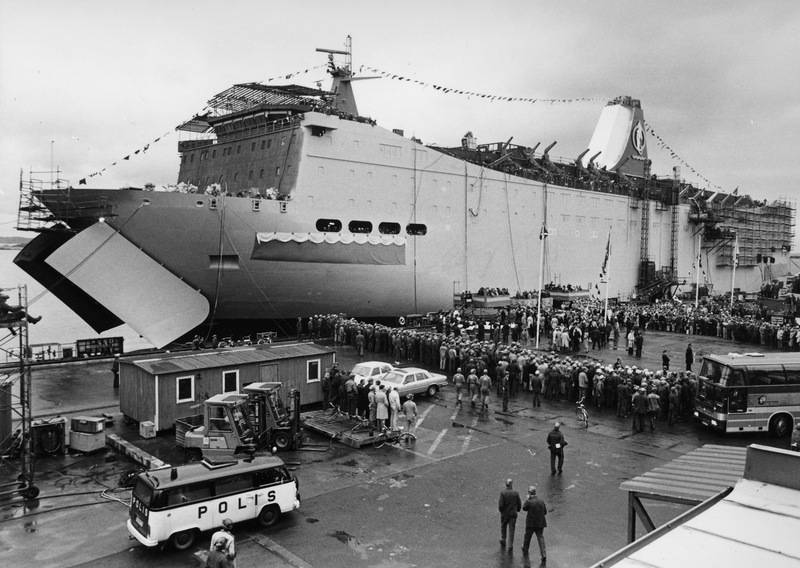 On Wednesday the 15th of October 1980, the first unit, GVA hull number 908, was christened by H.M Queen Silvia, who gave the new ferry her (then) four year old daughter’s name ‘Kronprinsessan Victoria’, (i.e. Crown Princess Victoria), during a traditional name ceremony. The Sessan Line had a long tradition of naming their ferries after princesses, that started with the ‘Kronprinsessan Ingrid’ back in 1936. 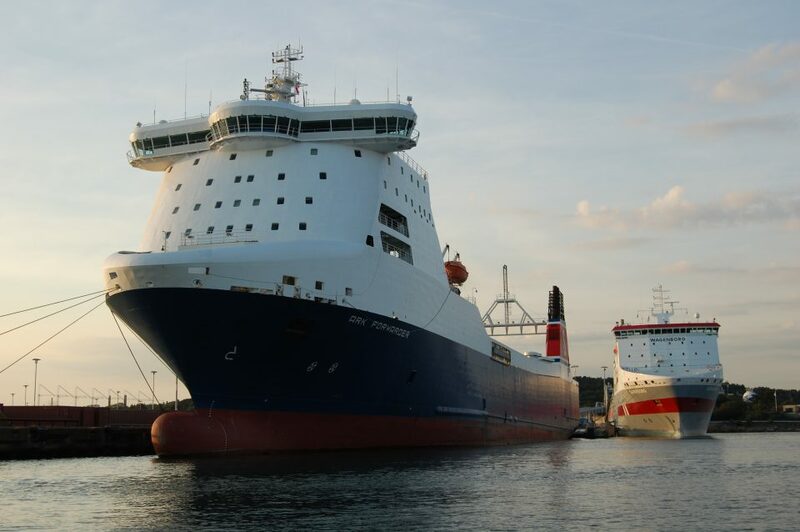 The new jumbo ferry was by far the biggest vessel ever to be planned for the Gothenburg-Frederikshavn route, and by the time of delivery, one of the biggest ferries in the world. It should be mentioned that Stena Line, still the major competitor of Sessan Line, did not react passively. Four months after the Sessan Line order was officially announced, Stena Line followed and ordered two slightly larger vessels at a French shipyard. Subsequently, the two competitors did now have four vessels in construction, ferries that, altogether, would have a capacity that stretched far beyond the actual traffic volumes. Something had to be done and to improve the situation, Stena Line began buying shares in Sessan Line. 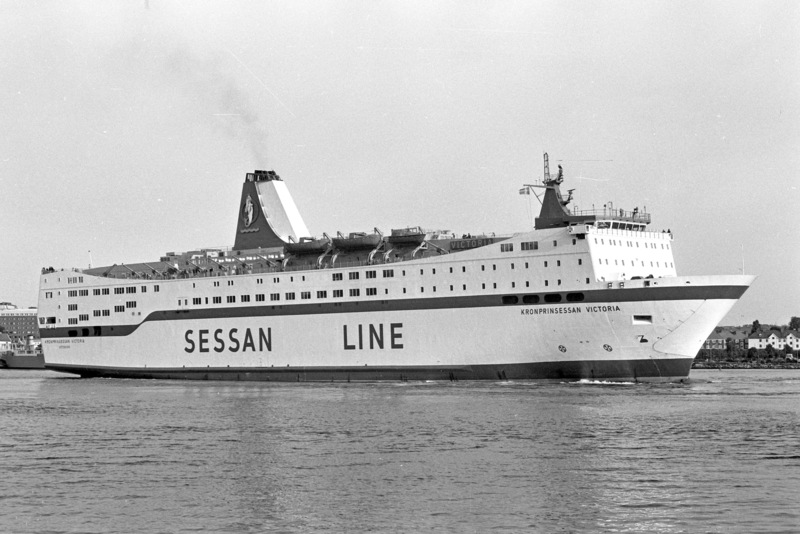 In early 1981, while ‘Kronprinsessan Victoria’ was on sea trials, with several months prior to her formal hand over, Stena Line had managed to obtain 51% of the Sessan Line shares. 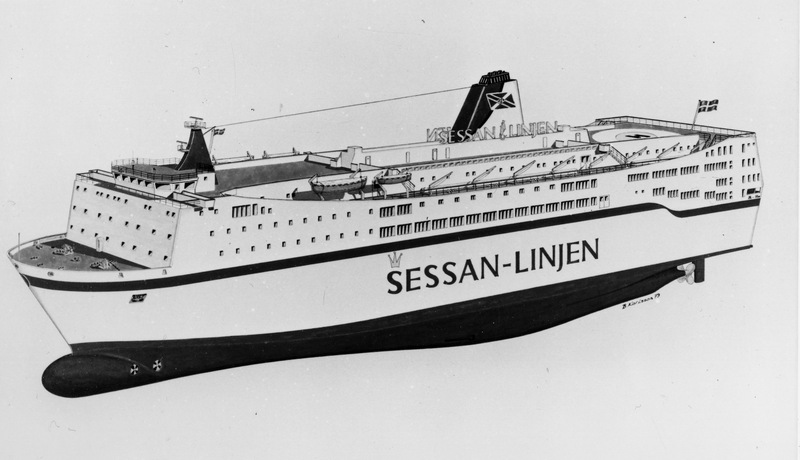 On the 1st of March 1981, a new operating company ‘Stena Sessan Line’ was founded and just about a month later, on the 10th of April, she made her maiden voyage to Frederikshavn, with specially invited guests. With a capacity of 2.100 passengers and 700, she was really a jumbo ferry. She had no less than three stern ramps, with the two outer ones, giving access to the main cargo deck no 3, whereas the third ramp, led to the upper cargo deck with a clear height enough to accommodate trucks and buses. As an option, there were hoistable car deck panels, that could be lowered, to utilize the upper cargo capacity for private cars, especially intended for the peak, summer season. Sessan Line’s intention was to make the new ferries totally independent from land based ramps, which would make them more flexible for other routes. The stern access allowed the main and upper deck to be loaded simultaneously, but during off-load in the Danish port, the main deck had to be cleared, before the access ramp to the upper deck could be lowered. The vehicles would then continue through the massive end hinged bow doors, via the bow ramp, to shore. Another interesting technical feature was the choice of propulsion and auxiliary machinery. Ever since the second new built vessel, the ‘Prinsessan Margaretha’ delivered in 1955, Sessan Line had developed a strong relation to the Swedish machinery maker NOHAB, located a stone’s throw from Gothenburg, in the city of Trollhattan. At the time of construction of the new ferries, NOHAB joined forces with Finnish Wärtsilä, and subsequently a new type of Wärtsilä-Vasa, ‘uniform’ machinery, with interchangeable spare parts between the main engines (propulsion) and auxiliary (generators) was chosen. A machinery that, although a relatively low output, proved to be reliable and with very low vibrations. The most remarkable section of the passenger accommodation was the two level theatre ‘Röda Nejlikan’, (i.e. ‘The Scarlet Pimpernel’), in the aft, shaped like terraces, that stretched from deck 7 to deck 8, with a stage in the middle. 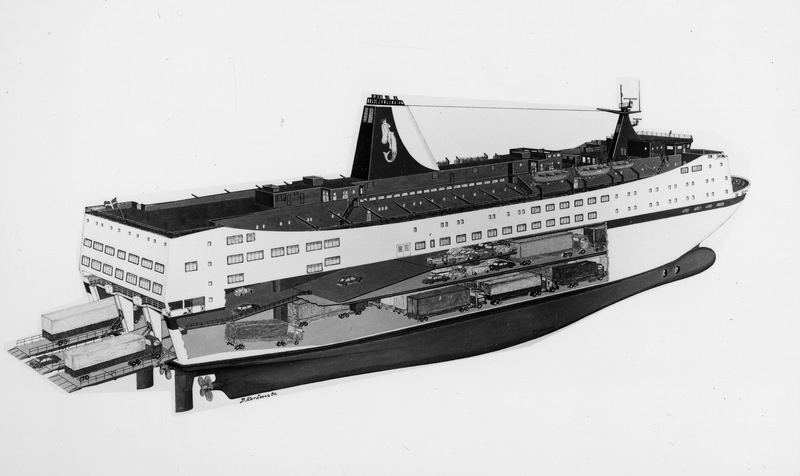 The arrangement on two decks was made possible by the fact that the internal vehicle ramp to the upper cargo deck, had the same slope angle as the theatre, physically located just above the internal ramp. For being a day ferry, Kronprinsessan Victoria had a very high number of cabins and beds, 400, and another 200+ located below the cargo decks. Needless to say, these were not fully utilized during her brief spell on Gothenburg-Frederikshavn, but proved very useful later during her career. In March 1982, she was taken out of day service and sailed to the local repair yard in Gothenburg, in order to be converted to a night ferry. Another 700 beds were built on the upper car deck panels, reducing the total car deck capacity with approximately 200 private cars. At this time she did also, for the first time, get the Stena Line livery. The funnel, with the fore section still painted in white, with the aft sections in red, the great white Stena ‘S’ and the top in black was probably the smartest looking one, ever seen on a modern ferry! One month later, in April 1982, she replaced the ten year old, much smaller, ‘Stena Olympica’ on the Gothenburg-Kiel (Germany) service, operated together with another former Sessan Line vessel, the ‘Stena Scandinavica’, (ex-‘Prinsessan Birgitta’). With the, somewhat limited maximum speed of 20 knots, she proved to be an excellent ferry for the connection to Germany, where she did overnight crossings, leaving Gothenburg at 7 p.m. and arriving in the north German city of Kiel at 9 a.m. She spent 6 successful years on the same route, and for the entire time, she carried her maiden name, although her crew had, at the time given her a nickname, the three letter abbreviation, ‘K.P.V’. In April 1988, Kronprinsessan Victoria was replaced by the new ‘Stena Scandinavica’, delivered from her builder’s in Poland. The economic growth in the late 1980’s was very strong and traffic volumes were still rising. Therefore, Stena Line made a decision to introduce Kronprinsessan Victoria on the Oslo-Frederikshavn route, a connection between the capital of Norway and the north of Denmark. The service had been established in 1979 by a smaller vessel named ‘Stena Saga’. 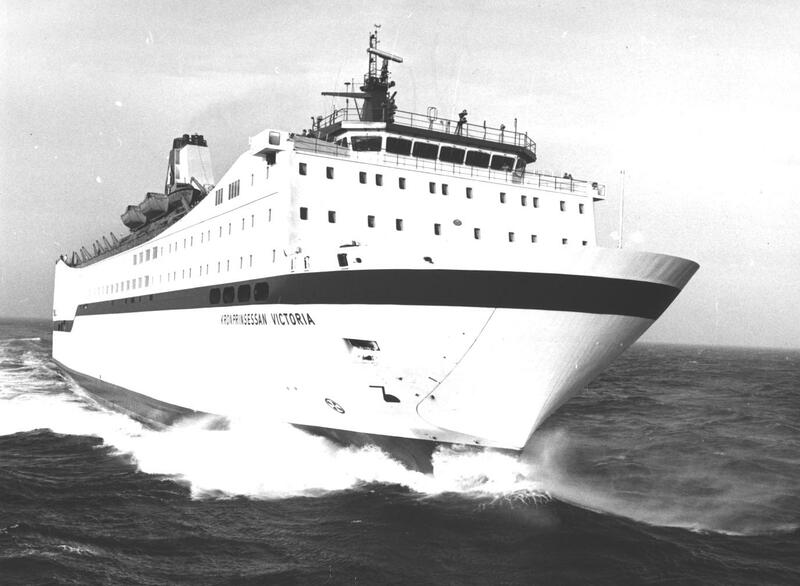 When Kronprinsessan Victoria was transferred to the new service, she inherited the name and thus, became the second Stena Saga. At the the same time, she was rebuilt with a new cabin compartment located on the top deck, right behind the wheel house, to accommodate the additional catering staff required for the new service. The Oslo-Frederikhavn route was gradually developed from a ferry route to a short cruise line, that mainly aimed for Norwegian passengers. 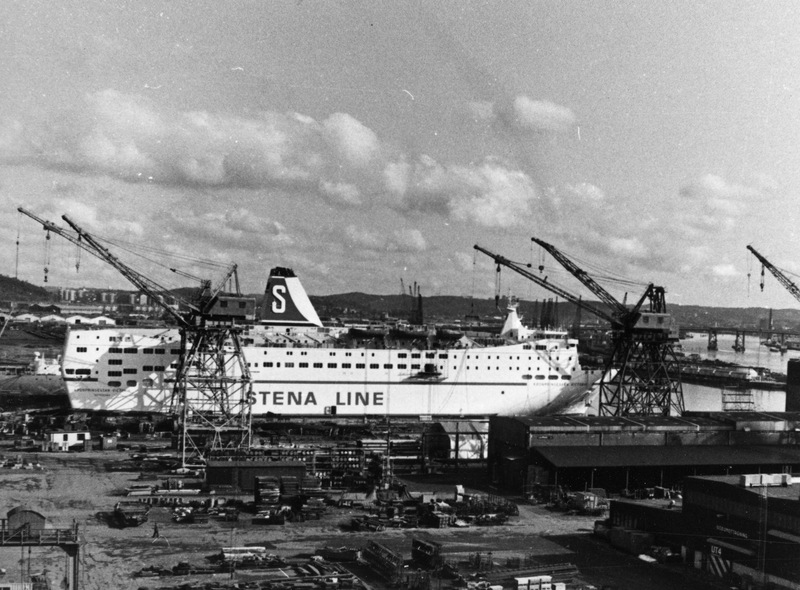 In the early 90’s, Stena Line saw a potential in attracting more passengers, with a vessel that could offer more in terms of restaurants, bars and entertainment facilities. 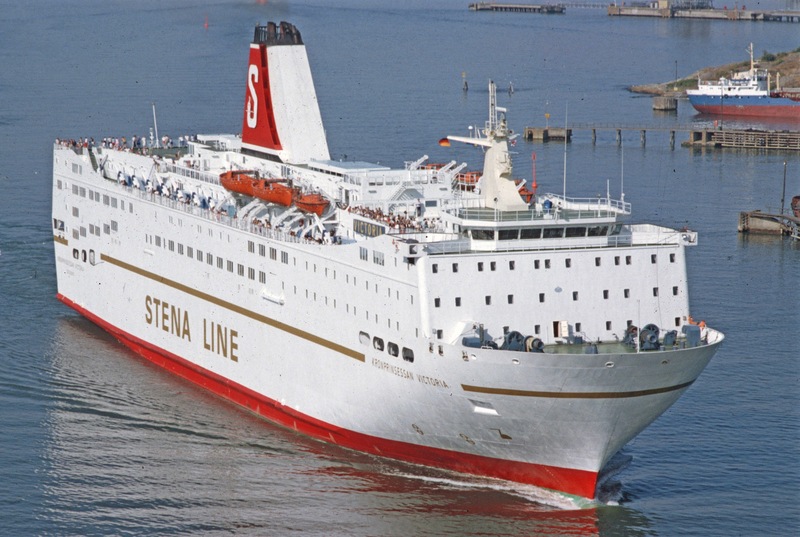 At this time, Stena Line was also expanding their activities around the British Isles and taking over the entire Sealink British Ferries network as well as the Dutch ferry company, S.M.Z. The Hook-Harwich service was (and still is) one of the main legs that connects the UK with mainland Europe. At the time, Stena Line was operating a vessel named ‘Stena Britannica’ in pair with the Dutch ‘Koningin Beatrix’, on Hook-Harwich. The Stena Britannica was, just like the theme vessel of this report, built in 1981, but for different owners and was, already from the start, a night ferry. In 1994, she swapped service with Stena Saga and subsequently, our theme vessel was introduced on the Hook-Harwich service. One of the first changes made was to remove the new cabin compartment, which, did improve her silhouette, and made her look more like she did during her Gothenburg-Kiel era. The reason for removing compartment was to reduce the gross weight, in order to accommodate full loads of trucks. As the Stena Britannica was renamed Stena Saga, a new name was chosen for our theme vessel. The new name was ‘Stena Europe’ and her slightly higher cargo capacity was very welcome on the freight dominated Hook-Harwich route, were she spent three years. In 1997, Stena Line introduced two high speed catamarans on the Hook-Harwich route and Stena Europe became surplus. She was then, for a short while, renamed ‘Lion Europe’, and operated by the Stena Line subsidiary, Lion Ferry, on a fairly new service between the south of Sweden, Karlskrona and Gdynia (Poland). This service has now grown into one of the most important routes in the network and employs two jumbo ferries, but that’s another story. Lion Ferry was fully integrated in Stena Line in 1998 and the ‘Lion’ brand was dropped. Hence, our theme vessel was once again renamed Stena Europe and painted in Stena Line livery. The final route change, until this day, happened in 2002, when Stena Europe was introduced on the Irish Sea, between the British port of Fishguard and Rosslare in Ireland. Before she did though, she was sent to the same local repair yard in Gothenburg where she had been converted into a night ferry 20 years earlier, to once again become a day ferry! The cabin modules installed on the car deck were now scrapped, which again increased the car deck capacity, a very wise move by her operators, with the ever growing traffic volumes across the Irish Sea. At the present day, she has now been in steady service for 12 years on the same route and is still going strong. We are now approaching the end of this voyage. The Stena Europe, with her long and successful career, is one of the most interesting ferries of the 80’s still in service. No matter if you are a ship’s enthusiast like myself, or if you are a regular traveller, you will probably enjoy a trip with her – a ferry with a very exciting history!